Macedonia’s vote on changing its name to North Macedonia looks to have fallen far short of the turnout required. Preliminary results show that just over a third of Macedonians voted in the referendum, with 50% needed. But with 90% of those who took part in favour of the change, the country’s prime minister has urged parliament to “confirm the will of the majority”. The vote aimed to end a long-running dispute with Greece, which has its own region called Macedonia. 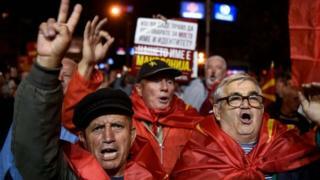 Athens had agreed to end its objections to Macedonia’s EU and Nato membership bids if the change was passed. Over 85% of votes have been counted so far, but a campaign by some nationalists – including the country’s president – to boycott Sunday’s referendum seems to have had an impact, with just 36% of eligible voters taking part. Prime Minister Zoran Zaev threatened to call early elections if parliament did not support the proposal, made non-binding by the poor turnout. “If, as we all expect, we truly have a big visible, tangible majority for [voting in favour], out of those who voted, then the future is clear,” he said after polls closed on Sunday. 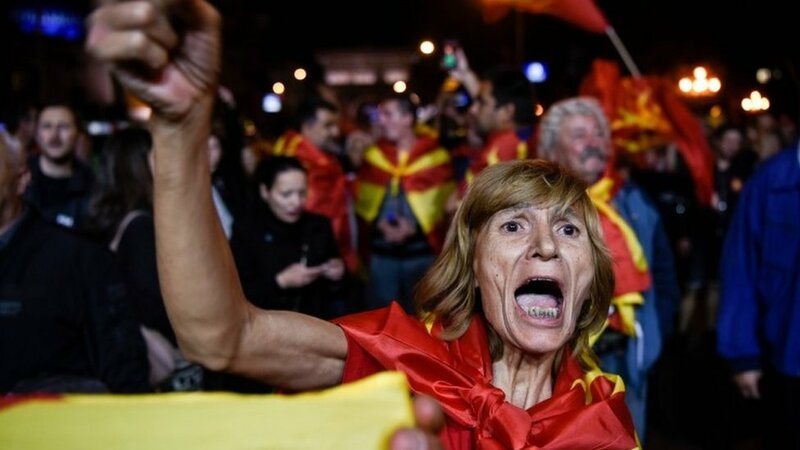 Macedonia declared independence during the break-up of Yugoslavia in 1991. But Greece objected to its new neighbour’s name. The dispute harks back to ancient history, because both present-day Macedonia and northern Greece were part of a Roman province called Macedonia. And both claim the heritage of Alexander the Great two centuries earlier. Greece’s objections forced the UN to refer to the new country as “the former Yugoslav Republic of Macedonia”. Athens also vetoed Macedonia’s attempt to join Nato in 2008 – and blocked its EU membership ambitions. The addition of one word to Macedonia’s constitutional name: North. Since 1991, many suggestions have been proposed, then rejected. But last year’s change of government in Macedonia finally brought the start of serious negotiations. What’s in it for Macedonia? Greece will end its veto on Macedonia’s accession to Nato and the EU. That applies particularly to Macedonia’s younger citizens. “Young people in Macedonia are a quarter of the population – and they’re one of the largest marginalised groups,” says Dona Kosturanova of the Youth Educational Forum. Opponents say the country has been bullied by Greece and the EU, pointing to the fact that top European politicians urged the voters to back the change. The leader of the main opposition party, Hristijan Mickoski, was quoted as saying that the proposed deal “will humiliate Macedonia”. President Gjorge Ivanov was among those who said they would be boycotting the vote. He described the proposed deal as “historical suicide”. Meanwhile, Russia has been accused of fomenting opposition to the name change to stop Macedonia drifting into the West’s orbit. Moscow denies the claim.